There is one thing that is rough about being here this summer in North Carolina. My car is back in Utah and we only have one car here to share. My hubby usually takes it to work, so we are usually stuck here. I have had to get pretty creative with activities and luckily we have a pool here. But I am sure counting down the days until we get back to Utah. We are starting to go stir crazy! I was craving chinese food for lunch. Luckily I could make something at home that is WAY better than takeout! I mean just look at it! Doesn’t it look amazing!? I love all of my baked chinese recipes. The sweet and sour, the firecracker, and baked honey sesame chicken. There is something about baking this and how the chicken browns in the oven and is so tender! The sauce is given time to thicken up and you have a big pan to feed a crowd! This is one of my favorite things to serve people because of their reaction of how amazing it is and how it tastes better than takeout! I have perfected the technique and could probably make it now with my eyes closed. They are all amazing just with different flavors. If there is one thing you make from my blog. Make this with a side of fried rice. You will never go back to take out! I have created a video for you with Ashlee Marie of the cooking process! You can skip to the Orange Chicken sauce at 2:19 or straight to the baked chicken technique at 6:52! 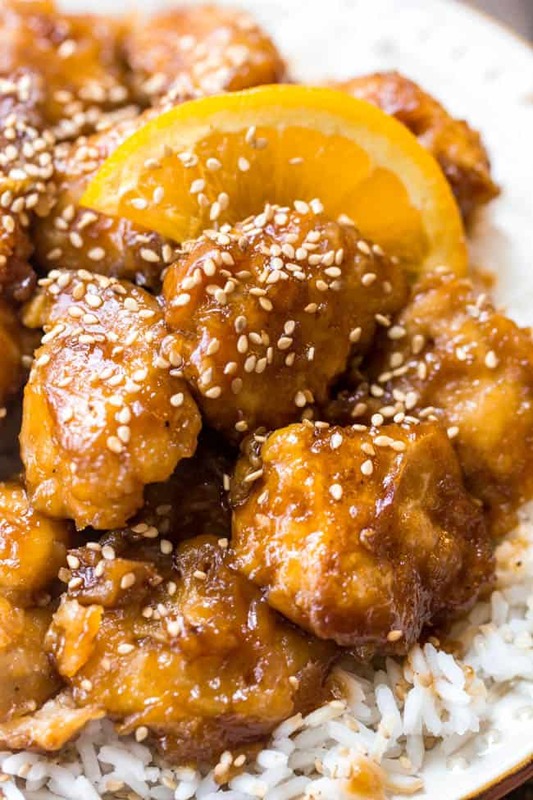 Better than take out Orange Chicken that is baked to perfection and will blow your mind! In a medium sized mixing bowl, whisk together brown sugar, orange juice, sriracha, apple cider vinegar, grated orange peel, white vinegar, soy sauce, garlic salt, and cornstarch. Pour over chicken and bake for 1 hour. I stir the chicken every 15 minutes so that it coated them in the sauce. You and your chinese food! It’s all so amazing looking! My roommate in college made something similar to this, and I still dream of it. I will definitely need to make this ASAP— we LOVE chinese take out, but that stuff comes with a heaping side of guilt that I don’t like so much! 😉 This is way better. I love Chinese food, but almost every single time I order it out, I get sick afterwards. I’m going to try making this because it would be so much better for me than the stuff they serve in the restaurants. This looks great- going to make it tonight for dinner. Do I just brown the chicken in the pan and finish it while it bakes? I don’t cook it all the way through in the pan, right? No you don’t need to cook them all of the way through. Just lightly brown the outside. It is baked at a low enough temperature. If it is cooking faster because oven temps vary, take it out sooner. I think what happened also was that it all depends how long you brown it on the pan too! I wanted it extra crispy so kept it on the pan longer, cooked for 30 minutes at the recommended temperature, took out one of the pieces to taste (tasted and felt ready), transferred the chicken pieces to another pan (to leave the sauce behind since I made extra), and broiled in high for 5 minutes and then broiled it in low for another 10. I served the extra sauce on the side and the chicken was nice and crispy and had dipping sauce to add more sauce to taste:) AMAZING! I also cooed the chicken in coconut oil since it is the oil I use. Oh my… looking for OJ right now.. got to make this NOW! Yum! Hi can i ask that is Sriracha and there i can buy it? At any grocery store in the chinese food section by the soy sauce. I just made this and your easy fried rice for dinner…what a success!!!! Instead of corn starch, I used arrowroot powder and it turned out great. Thank you so much for sharing your delicious recipes! My family really enjoyed their dinner tonight!! Do you think you could substitute coconut oil for canola oil to make it healthier? I made this tonight along with the fried rice recipe you posted last year. My family absolutely loved it. Mind you I am not someone whi can just cook. I really need to follow a recipe and this was easy to follow and quite superb! Thanks for sharing!!! My family loves this recipe! I made it last week and had no leftovers. Am making it again tonight per their request. And the fried rice is amazing, too. This was very good! However, I would double or triple the sauce. Thanks for the recipe! Just use a grater and finely grate the outside of an orange to get your orange peel shavings. I have made orange chicken before, and although I deep fried the first time that ended up being a lot easier than this. I pan fried it all together this time but the coating came mostly off all the pieces, and left me with a lot of scrambled eggs in the pan. I would actually recommend just using 4 egg whites instead of 3 whole eggs. Also it is difficult to cook the chicken as you coat it, so I would recommend having a helper to coat the chicken while you do the cooking/browning so you may add the pieces as they are coated and remove them once they are browned. Other than that it still turned out well! The sauce is much better than the other one I made. I just have to say that your chinese recipes are OUTSTANDING!! Chinese food is my boyfriends all time favorite food. This guy could eat it everyday if I’d let him. Now with this healthier recipe, I wouldn’t mind eating it close to everyday as well! Although this does take a good amount of time, it is WAY worth it. Not only for the amazing taste, but the awesome brownie points you get for serving such an awesome dinner that they can’t believe YOU made. These recipes will definitely be a regular in our house! 🙂 Thanks! I made this and it tasted great! My only problem is that when I cooked the chicken I the pan, a lot of the egg came off and stuck in the pan. What did I do wrong?? I use stainless steel pans. 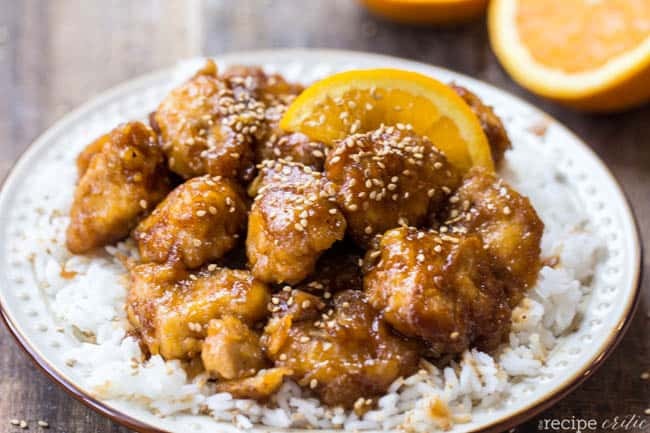 I have been wanting to try homemade Orange chicken because my kids love it. Trying to get away from outside type foods. This was a big hit!! I did not need to cook it for an hour in my convection oven. It was probably close to 30-40 min. And it was perfect!! I also used less brown sugar (tasted the liquid sauce as I added the sugar to the sweetness I wanted). Tried this last night and it was amazing!! I used coconut oil instead of canola and it really added a delicious flavor (especially with the yummy orange sauce!). We eat a lot of chicken and sometimes it gets boring…thanks for helping me make things interesting! Can you substitute chicken thighs? That’s what I have on hand, and is like to try this tonight. I’ve made two of these “better than take out” recipes so far, this one and the fried rice and both are on point. Delicious, straightforward, just great. So proud of myself for making this for dinner tonight (new graduate, trying to learn how to cook lol!) It smelled delicious and had awesome flavor…but the sauce didn’t thicken very much 🙁 Any advice on how to thicken the sauce?? HI! I had the same problem and just added some cornstarch to thicken. I did add it at the end so the cornstarch kinda created some lumps I had to break down so maybe start with adding a teaspoon when you add the dry ingredients in the bowl first:) Good luck! Used 1.16 pounds of chicken breast cut into 1″ cubes and made a full batch of the sauce. Put 1 Tbsp corn starch into a zipper top bag and shook around. Added the chicken and then another 1 Tbsp of corn starch to the bag. Zipped and shook. Added another 1 Tbsp and repeated the shaking. Everything was nicely coated, it only took about 5 minutes for everything (I tried the “dip in the corn starch and egg” method and it took over a half hour to just coat the chicken – NEVER again), and didn’t waste an extra cup of corn starch. I hate food waste! Only needed 1 beaten egg to coat everything too. I used a stainless steel frying pan and the chicken didn’t brown as much as I like, but it did get a bit too dry on the inside. Next time I will make the cubes a bit bigger; probably 1.5″ cubes. After cooking the chicken, I added the sauce straight to the skillet and popped the whole thing in the oven. There was enough sauce to spoon over the rice after it thickened in the oven too; perfect for our little plain rice hater. This combination of methods made much fewer dishes! Everyone liked how it turned out, but I thought it was missing something and I’m not sure what it is. “I kept in in the pan longer” : As in I browned the chicken longer in the pan with the coconut oil, then cooked it in the oven. We made this tonight for dinner and it was great!! A little time consuming even with my husband working with me. We are going to try a really large batch and freeze it, then just make the sauce as we need it. Success! I’ve already shared the link with our daughter! Delicious! 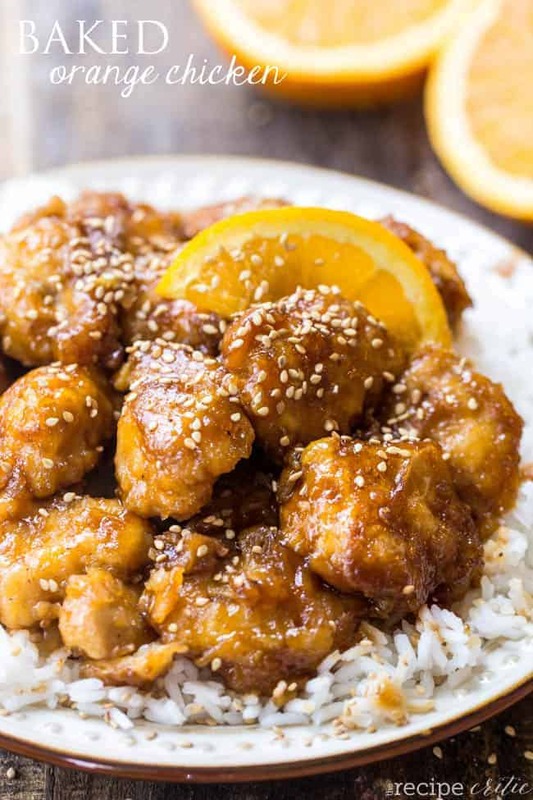 Just for fun, I made 3 different blogger’s orange chicken recipes and yours was voted the all around favorite by my taste testers! I plan to try the Ziploc method to speed things up as the cornstarch/egg process is both messy and time consuming for me. I also would like to steam some veggies and make extra sauce. Thanks for a great recipe for enjoying homemade Chinese restaurant food. It was soooooo good, I tweaked the sauce until it got to the rate I wanted and it was great. I want to thank you because my Mom just had surgery on her shoulder and she loves orange chicken, I made it for her and it really lifted her spirits. I’m making it again for her this Friday. Thanks so much? didn’t turn out well. ! I don’t taste anything but SOUR! I had to tweak it a lot, to get a good taste. I put ginger, a little bit of honey & sesame oil, made a huge difference. “Dinner tastes like PF Changs back in the day” per the hubby! Thank you for sharing! Times the sauce by 1.5 since we love sauce over here, and used rice wine vinegar instead of apple cider. Other than that, followed the recipe exactly and it turned out perfectly. Can’t wait to make this again! !